NEWSPAPER CLASSIFIED AD BOOKING THROUGH BOOKCLASSIFIED.COM AGENCY/COMPANY IN SAMBAD NEWSPAPER. Bookclassified.com company/agency is best authorised agency/company for newspaper classified ads, classified ads, ad company,classified ads in newspaper, newspaper display and text classified ads, newspaper online display and text classified ads, newspaper classified advertisement, newspaper ads, online newspaper classified ads booking services, newspaper online display and text classified ads booking services, online classified ads booking services, online classified advertisement, online newspaper classified advertisement, book newspaper classified ads, book newspaper classified ads online, release newspaper classified ads, release newspaper classified ads online, classified ads booking in newspaper ,times of india newspaper classified ads booking services, samaja newspaper classified ads booking, prameya newspaper classified ads, etc. PLEASE VISIT HOME PAGE OF BOOKCLASSIFIED.COM WEBSITE FOR NEWSPAPER CLASSIFIED ADVERTISEMENTS BOOKING THROUGH US. SAMBAD Newspaper classified newspaper advertisement booking through bookclassified.com agency/online portal company which is authorised ad BOOKING agency/company for all leading newspapers across India where u can successfully choose state, select newspaper,choose category,view rate card price, compose text classified ads or display classified ads as per requirement, select publishing dates in respective newspaper, successful online payment through PAYUMONEY APP in our online portal www.bookclassified.com and successfully getting ad published in india’s most leading NEWSPAPERS across states of India.Also user can get online assistance from our dynamic professional team. Contact 0671-2366505, 8637253502. Various categories mentioned in bookclassified.com agency/online portal company for SAMBAD newspaper are TOLET/RENTAL, SALE, HEALTH, AFFIDAVIT, CONSTRUCTION, MUSIC, LOST OR FOUND, SERVICES, EDUCATION, TRAVEL, MATRIMONIAL, PROPERTY TO SALE, AUTOMOBILE, SHOPPING, COMPUTER, TENDER/PUBLIC NOTICE, PROPERTY,REMEMBRANCE, OBITUARY, RETAIL, LOAN, MEDICINE, REAL ESTATE, ENTERTAINMENT, COMPUTER, etc. User should select paper here under CATEGORY EDUCATION or any other category which user wants he can select. 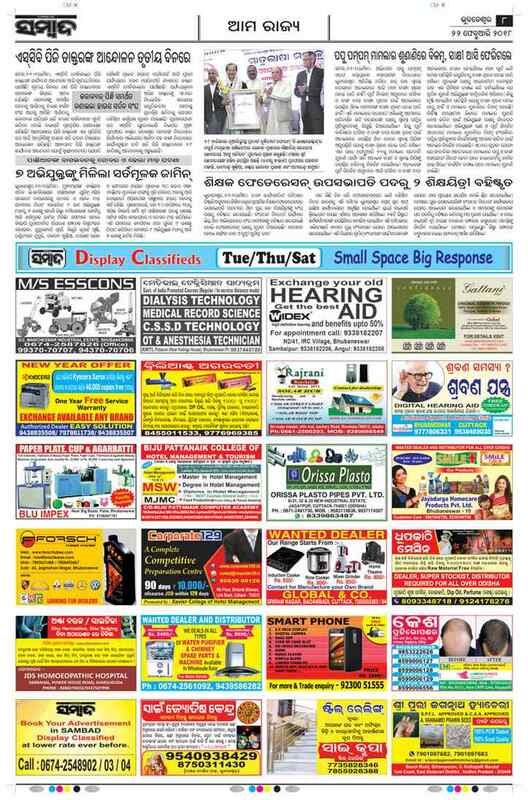 User can view classified advertisement in ORISSA'S SAMBAD NEWSPAPER.